29-44 - The charming photo taken in Brazil shows us “Miss JF (after Juiz de Fora”, a city also known as J.F. in the southeastern Brazilian state of Minas Gerais, located close to the state border with Rio de Janeiro). 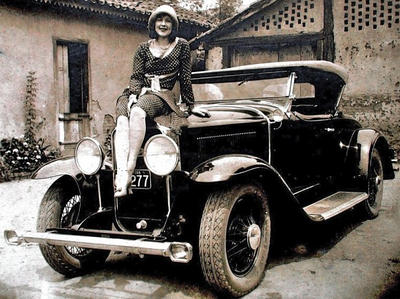 She is posing on top of the rad of a sporty 1929 Buick roadster. She is wearing a polka-dotted dress, high heels and an attractive hat, all in the fashion of the time. The Buick is equipped with quite an expensive accessory bumper with driving lights in either end. The photo is courtesy of Marcelo Lemos via Guilherme de Costa Gomes’ site .